I was never a good student. I never had the ambition to be on top of my class. You know how puberty is the period where we shape our own identities? I went through peer pressure, irrational crushes, playing the guitar, sneaking out of the house (or in. I'm sorry Mom and Dad) - and I never found any answers there. I found them in reading. I always, always loved to read. I found that books (or any other physical manifestation thereof) provided me the space to question without any judgement. Arya: Stres banget sih kamu, dari SMA baca beginian (Bibel, Quran dan Sains Modern, upon eyeing my book collection). I remember the feeling of realising for the first time that some people accept me for how I think, what my arguments were. Not the way I look, the clothes I wear, not even the music I listen to. For the first time, I wasn't categorised in a social class. I wasn't stereotyped. And then I learned how to not do that as well. I think that knowledge should give you a chance to be moderate. To realise that we could never know for sure. That all views are relative, that the world is too complex for us to fully comprehend. And that is why I chose Academic Life. It's a space where ideas are alive. Where we give ourselves a chance to be wrong. To not take things for granted. Though at moments things are not as ideal, it is the closest to that utopia that any other sector I've set foot in. Don't worry, I'll put the knowledge into practice. But I'll always have one foot in the academia. Just to keep my head in place. When writing an article or a thesis, you don't have to read everything about everything that's been written on your topic of choice. Start from the most recent article/book that's received most citations. Google Scholar is very handy. In the olden days, scholars cross referenced their sources physically in the library, now Google Scholar would do. Then, see how the writer quoted his source. Good writers, those most often cited, almost always acknowledge the many conflicting views within that topic. Go to his sources. This is one of the ways to do diagonal reading. The second way to do it is by key terms. Usually in journals, key terms are mentioned under the abstract. Find those key terms in the article and see how he/she defines it. This approach is also called skim reading. If you 'see' the whole page, the key terms would fly above the radar and the conjunctions would blur out. Instead of spending hours on a 20 page article, it will only take you 10 minutes to figure out the main ideas and important definitions. Note: Journals are more recent than books, their findings are more novel and progressive (usually criticism and/or a development of previous concepts and/or theories). And only when there is one consistent book mentioned in almost every single text (journal and book) - that you need (obligated!) to read that book. Kind of like Benedict Anderson's Imagined Communities if you're writing on national identity or McQuaill when you're writing about Mass Communication Theory or McLuhan or Stuart Hall. You get the gist. It is because these prominent books re-defined the approaches to an area of study. Do you see how I've bold-ed some terms? After reading what I've written, those bold terms make sense, don't they? Without repeating reading the text I've written, you know what they mean - and you can explain with your own words, only by re-mentioning those words, in a new paragraph, explaining everything that I've explained. Now try to do it backwards. Forget you've read what I've written and find the definitions of citation, diagonal reading, key terms, skim reading and consistent book mentioned. Arrange the definitions in your head and re-write them with your own words, with your own conjunctions. That is the logic of diagonal reading. Now, if you need a crash course, I'd be glad to give it to you. These skills are useful for writers and my aim is for all of us to be 'sharper tools in the shed'. Finally, after three months of waiting (for the film to play in theatres and then for me to have time), I have finally seen Reitman's newest. You want to hear something ironic? I accidentally watched the ending of the film on my way to Sydney around a week ago, on Qantas. So literally, Up in the Air up in the air, for me. 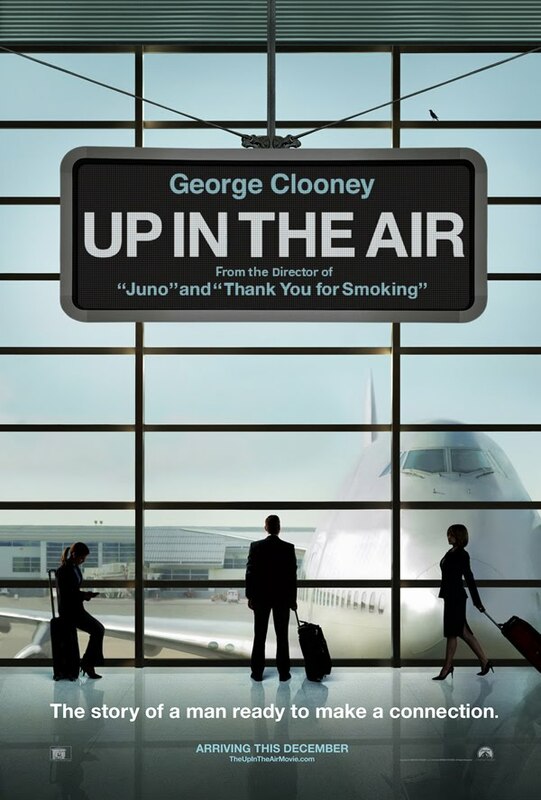 I loved the interplay between (global) enterprise symbols (Hilton, American Airlines, Hertz) and the contrasting effects of the lay offs (mind you, Reitman had real (laid off) people speaking in the film). How some giants remain giants while the faceless workers are dehumanised, and survivors become the elite. It was very cynical and I couldn't help but feel a hint of socialism in the film. Maybe he was aiming for humanism but when you reveal the ugly face of capitalism it's kind of inevitable. 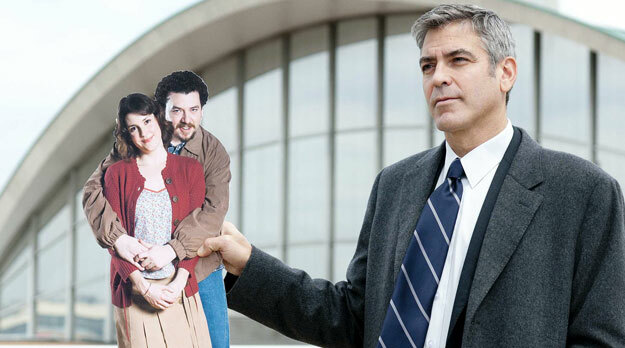 There was a scene where Bingham's (Clooney) future brother in law had cold feet before getting married. The huge step was suffocating. Marriage, children, soccer games, graduation, their weddings, grandchildren, death. What's the point. But all I could think of was that this structure was also exemplified in Bingham's frequent flyer miles, loyal customer programmes and dozens of membership cards. It's just a different kind of structure. And so Bingham was left without words upon his 10 millionth mile. A thing he thought he wanted very badly. A goal he had headed towards as an intentional release from the more conventional social structures of marriage and settling down. And yet he too, had cold feet. I loved the questioning of the taken-for-granted reality. You think you want something very badly until you get it, then you question the whole purpose and value. This is the problem with linearity, be it confirming to the social norm or defying it. Bingham's older sister (Morton) asked him to take a cut out cardboard photograph of his younger sister (Lynskey) and her future husband on his travel, so that they had honeymoon pictures without traveling - as they're left without honeymoon funds to pay for property investments. There is the contradiction between fixity and fluidity. For his sister, fixity was her relationship. The spaces are fluid. They could be anywhere, nowhere, a lie or true traveling - and what mattered was their relationship. For Ryan Bingham, the spaces are fixed. The only certain thing in his life is his mobility, with all his relationship baggage (pun intended) stripped off to the bare essentials. For him, people are fluid, they come and go. It got me to thinking about choice. How what matters to us is highly dependent on what we need 'fixed'. For some it's family, for others its personal development. I don't think either is the wiser, as long as the decision was made consequently. I know I'm straying off focus here, but I just can't help it. I couldn't help but feel pangs of familiarity with the security checks and checking in and boarding and packing light and dragging my small suitcase everywhere. I did more traveling in the past five years compared to the first 22 years of my life. And I couldn't help but feel validated, that for me, traveling is only exciting as long as I have a home to go to. The people, the physical space, the notion of home. And I also couldn't help wondering that once it loses its novelty, every place, no matter how exotic or grand or inspiring - once we've adjusted - will lose all its attractiveness. Usually it's then when I would love to go home. I am no Ryan Bingham. I have always loved Jason Reitman's work. I loved Thank You for Smoking and I loved Juno. But hands down, Up in the Air is his best so far. It deserved all the praise and critical acclamation it received. I think he is the best (new) director in the past decade, coming from our generation. He covers capitalism, ethical and moral debates, sub culture, social marginalisation; all coming from a son of a successful capitalistic director. The difference in ideology between his father and he is staggering. What I really love? He isn't judgemental and self-righteous. He says it like it is, lays it out for the audience and I pretty much leave the theatre reflecting on life and meaning. No absolute right or wrong. Just reality and construction. Which is how it's supposed to be, with film. And to communicate all this with an aesthetic mise-en-scene and a great choice of cast (Clooney and Kendrick in particular), I applaud. I truly hope to see more to come from Mr. Jason Reitman. In social science, it's common to label a person left or right (or the undecided in between, you can never win) through the theories, authors and paradigms they cite on. A little too easy. I know this is naive and I am fully aware of that fact while typing these words. I am neither here nor there. I will use any paradigm, theory and/or cite on any author as long as its purpose is to end injustice (towards the 'marginalised' and 'poor') in society and to say what is true as true. If there could be a sustainable business model that provides education and health care, both in the broadest sense of the word, to the 'poor', I would be first in line to support it. I don't even think serving the (political economical) interest of the priviledged could taint the purpose as long as this target is achieved. Honestly, for me it's as simple as that. A big dream from such a little person, yes. Now if only I can find two very large and strong hands to set the dreams in motion. The first article was on tktq+ (yes guys, remember that. That was what he did with his free time while studying in Amsterdam) covered by Koran Tempo in 2007 (see below). Looks to me that his (one of his) niche(s) is the Indonesia new media industry hmmm... 1+1=3. As I was leaving for the leadership conference in Canberra, I was already wary of the title. I had presumptions, emphasis on the 'pre', of how it would be. I know it's aimed at 'character building' and 'finding the leader in all of us', not that I am against the idea, but I have always been reserved to these types of trainings (AsiaWorks, ESQ, etc). Firstly, I think character building is a life long process, at least for me, and it would be very difficult to pack it into a week, let alone 3 days. Secondly, leadership is a broad concept. I am not a leadership scholar, and from what little I know of the area, I think leaders are not necessarily those in the spotlight. They are the random traits in each and everyone of us, inspiring others (and ourselves) to do the right thing. Conventional roles like manager, president, director are all easily identified. But leadership roles that are often overlooked, a parent, a lecturer, informal leaders - all contain aspects of leadership, without attaining its role. Leadership through ideas, not through the people. But it's nevertheless a mandatory course of my scholarship and I did meet very interesting people throughout the region (including the enlightenment the course gave me on the Pacific Islands, which I was very ignorant on before). Some friendships I think I'll carry with me decades afterwards. 1. No matter how exciting adventures are, there is no place like home. 2. No matter how inspiring some people are, the people my heart aches for are the people I love. I love, love, love traveling. I love the mobility, the constant move, the learning opportunities, but these are all worthy, I think, when I think of the settlement I am blessed with. I just began thinking that I am the type of person that could enjoy adventure only to a certain point. When I get wary, tired, I realised that I hear that voice in my head that says: 'Okay, I think I've had enough. I am ready to go home.' And I don't think those adventures would be as interesting if I didn't have a 'home' to go to. And this was confirmed when I was physically so tired that my body began to break down. I know that I would be ok, I know how to survive: make sure I eat nutritious food, take a walk outside for fresh air, get vitamins and basic meds, sleep, etc. I know without loved ones I could survive, but they make the process so much faster and comfortable. At least for me. And yes. I got so tired that I overslept. After 5 connecting flights in 6 days, I finally missed the one that mattered the most: the flight home. I woke up at 1AM when my flight was on 2AM. When I arrived at the airport the check in counter had closed, I was 10 minutes late. I did all I could, from banging the airline office's door, talking to security, immigration, and finally gave up when the airport manager said there's nothing I could do. I was tired, sick, and I was very ready to go home. When I thought about it, I don't think I would do it any other way. Even if I knew I couldn't get on that flight, I would have still hopped on a taxi and went to the airport to go down kicking and screaming - just to make sure I did everything I could. Then I would dust myself off and try again. So I took a deep breath, drank my bottled water, and sat down for a while. Then I walked over to the monitor to see the earliest flight back. I bought tickets on the 4AM flight with connecting flights. Had a healthy breakfast and slept on the plane for almost the whole trip (seriously). Discussed logistics with Arya and landed safely on 10.30AM. Oh I learned another thing. I do not like connecting flights. Especially ones that include planes with propellers. 'Tapi, Inaya, pesawat dengan baling-baling itu lebih aman lho daripada BOEING. Soalnya kalau mesinnya mati, pilotnya bisa nerbangin sampai mendarat,' said an ALA scholar before boarding. Yes, this is the kind of information you want to hear before boarding. He was sleeping and Arya and I were hovering above him. He peeked, smiled. Then his eyebrows met like he was thinking in his sleep, he opened his eyes, looked at me confusedly, and he cried like it was nobody's business. I think he felt a bit betrayed (assuming I had the skills to translate his cry) and that suddenly everything fell into place to logically decipher my absence as real. It took him a while to adjust to my being home and for me as well. But I do remember my parents not being home when they had duties abroad and all of us survived and turned out travellers as well. So I am an optimist that this is as much a learning process for Malik as it is for his mother (and father). One of the positive points is the fact that he is now attached to Arya like he wasn't before. And although it's bittersweet for me as the (former) dominant caregiver from my pregnancy to breastfeeding days, this is actually healthier for him. The more sustainable his support system is, the better he will survive and acquire confidence. Which reminded me of a speaker from the conference who spoke of gender issues. I wasn't in full agreement with all her points but I did agree with one. The current industry does favour men over women. But the logic works otherwise. The current family system favours women over men. There needs to be social opportunities for both, so that personal choices are not forced upon us but laid out for conscious decisions. Women's ability to bear children are fixed. But raising children, that is fluid. It is a role both parents may excell in, and both should, whenever possible. A child may benefit from the presence of both parents with each of their unique characteristics. And it turned out, my going away for a while provided this opportunity 'equity' in our family system. Throughout the trip I had little to no internet connection, so I barely had the chance to talk to Arya. We survived alright, we're adults and we stand on our own two feet. Almost five years into marriage you tend to not dwell on 'I miss you's. But it was when we began talking and cracking jokes and discussing things that I realised: he is really my bestfriend. Ours is a relationship where we are sound individually. We work well without each other in our own niches. I am not miserable without him and neither is he. But after talking and 'opening the faucet' so to speak, I realised I was profoundly happier. This level of commitment I think comes with responsibilities. And it is my responsibility to earn his trust wherever I go, whoever I meet, no matter how far away from home I am - as he does mine. Arrived at 2AM, things are more efficient now that I know my way around the house. Frances and Charlie didn't even hear me settling in the front room. Slept at 3.30AM, woke up at 8AM, then off to campus with Nicole, breakfast and session on 10.30AM. And now I have to do massive editing on my first chapter. But alas, comments were very, very constructive and I can really see how much I will learn in this project. 'I knew since the moment I read your proposal that this will be an interesting research. Your work so far has only proven that,' said Garry Rodan (my 3rd supervisor. Yes, I have 3 supervisors). Sounds nice, eh. Wait until you see how much I need to re-write haha. It's nicer now that I have learned how to just enjoy the process. I am enjoying the fact that I learn a lot of things throughout the project and I don't think too much about the end result (like grades or criticism, etc). I think at the end the goal is to learn as many things that I can, especially that I'm on a free ride (snicker). And I think that goal is accomplished every day. So that's how I see my PhD project. A learning process. If I produce something useful then that's a bonus. But this project, see, it's my 'school'. - I have a name card haha. So I finally have a formal business card to give away at the conference in Canberra. - Rachmah Ida's book arrived safely. 'Imagining Women in Indonesian Ramadan Soap Operas'. - I bought stuff for the whole family. Ibu-ibu banget deh, I can't help it. I particularly like Arya's and Malik's T shirt. - The ice cream in front of Guido's on the cappucinno strip is unbelievable. - The seagulls and crows apparently see me as a giant bread. They hover around me constantly, at Murdoch, at Fremantle. - I drove Nicole's car in the city. Just accross where the water is and it's very nice (ngga macet). Just as I passed the House of Parliament I really missed Malik, Arya and Zaki. We spent a day there last year (it's been a year already?). Balik lagi yuk, semuanya. - I got an angry call from the library for returning books without its barcode (ternyata sama Cano dicopot pas fotokopi trus ngga dipasang lagi). So I need to be extra careful the second time around. Untungnya: 'I don't know if you have small children in your house, but you're not supposed to take off the barcode stickers.' 'Oh, I actually do have small children in the house. I'm very sorry.' But the small children are innocent (maaf ya, Kaka, Malik dan Omar, jadi kambing hitam). So to wrap things up it was a good day with its ups and downs. I miss everyone but I can't really complain about the things I get to do here. I think it was circa 2005 that I was really disturbed by the use of surnames. The hypothesis is: the more prominent your family is, the higher the probability you would use your family's surname. It really contaminated the idea for me at that time. But it turned out, I thought to myself 5 years later, the surname is merely a symbol. It's when the prominence of your surname overshadows your own contribution that it becomes an issue. It would appear, then, in these situations, that the offsprings are riding on the coat tails of their forefathers. But when you speak for yourself, despite the name behind your own - I found myself less concerned. Anies Baswedan. Najwa Shihab. To name a few. They are themselves, despite the surname they carry. The consistency of their work and how it reflects their character stirred me away from what both of their families have accomplished*. So I guess symbols are idiosyncratic, if you will. And, like anything else in life, intentions are what matters. And that, is not for me to judge. But just to play it safe, I don't keep a surname. *Come to think of it, it could also be related to the fact that they come from a line of intellectuals. Perhaps families of businessmen would exemplify another trend. yang dinilainya kecil serta yang secepatnya dilakukan. I would be happy to do it for you. Moss: Yes you do. You've just used a double negative. My second time traveling without Malik, 2 nights longer than the last one. You would think it would be easier this time around but it's not. He's in a period where he calls out my name 10 to 20 times a day. But lodging's taken care of, supervisory sessions in schedule, flight, itinerary, conference registration, everything: check.